There are some people who manage to find something special everywhere they go—and globetrotter and photographer Ana Linares is definitely one of them. Her Instagram is filled with vibrantly hued, perfectly detailed shots of her travels, whether she’s basking in southern charm in Charleston, South Carolina, or exploring tiled streets in Lisbon. It’s clear she has an eye for great vacation destinations, and also the savvy to find all the most exciting hotels, restaurants, and sights when she’s there—and that’s exactly why we turned to her to get some much-needed warm-weather travel inspiration. Linares took over our Instagram to share three of her favorite travel destinations in 2018, and although they may span three continents, they share one thing in common: they’re sure to give you kaleidoscopic, wanderlusting dreams. “If heaven had a doorway, this would be it. This beautiful gate is part of City Palace in Jaipur and it’s called The Lotus Gate. It represents summer and Lord Shiva, adorned with dramatic lotus petals and flower patterns that were all carved by hand. It’s truly fascinating. Each door has its own character and tells a different story.” Photo by @ananewyork #SOdomino. If you already miss summer more than you thought was possible, consider a trip to Jaipur, India, where you can admire the City Palace’s Lotus Gate, pictured above. Decorated with ornate floral patterns and lotus petals, it’s representative of both summer and Hindu god Lord Shiva. Jaipur is nicknamed the “pink city” because of its buildings’ signature pink hue—just look take a look at the other nearby palace, Hawa Mahal, and you’ll get a very strong idea of Wes Anderson’s inspiration for The Grand Budapest Hotel. Don’t miss the city’s rich bazaar scene, where you can haggle your way to collecting gorgeous leather goods, jewelry, jutti, and pottery. 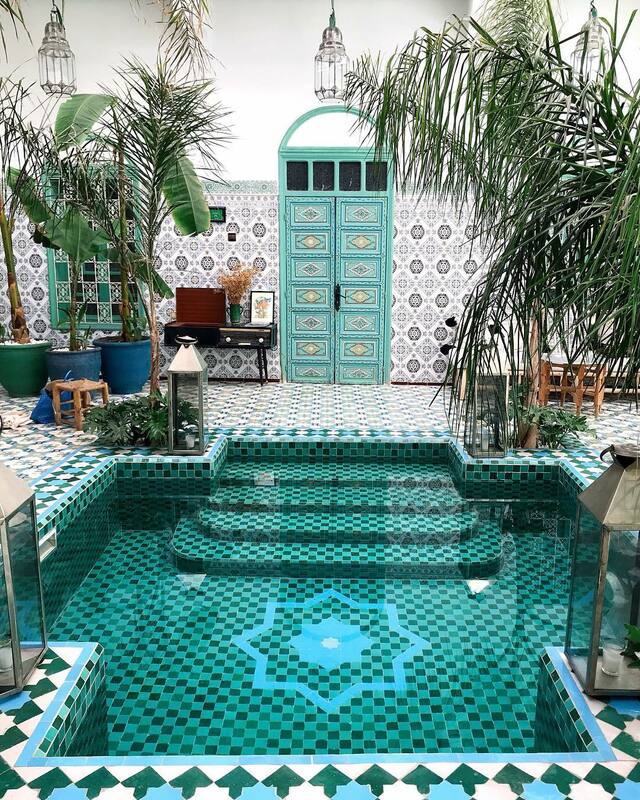 Marrakech is filled with riads—traditional Moroccan houses with interior courtyards. Often, they are colorfully tiled, filled with lush plants, and can even include a pool. Riad BE is a boutique hotel located right in the heart of Marrakech, and in addition to its stunning courtyard above, it also features a spa and a yoga studio. Plus, cooking classes can give you hands-on experience with the aromatic herbs and spices that give Moroccan cuisine its signature fragrant flavor. Warm, tropical breezes, good food, and great music make Miami a dreamy destination to visit this winter, but the right recommendations can make or break your trip. Linares recommends Mandolin Aegean Bistro, a Greek restaurant pictured above. On the menu, you’ll find plenty of fresh seafood, plump tomatoes, and Mediterranean seasonings and toppings galore, served in an airy white-walled space that feels like it was practically plucked off the Grecian coast and placed just a few short blocks from Miami’s Biscayne Bay. Nearby, the Design District awaits you with plenty of galleries and shops to browse at your utmost leisure—just don’t forget to drop by ICA Miami to leave filled with plenty of design inspiration.